Exploration yachts are perhaps the last hope of real yachting, understood as the desire to get away from the crowd, from constricting spaces and conformism. With these yachts, which look like merchant vessels, everything is going in these directions, starting from the hull design that often takes inspiration from the typical waterlines of working boats: definitely displacement, then, and among other things with very full sections and very high form coefficients to guarantee internal volumes and the possibility of carrying great quantities of fuel. 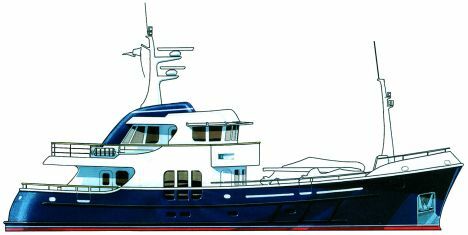 Unlike Mediterranean and "effeminate" boats which generally have lengthened and fairly slender hulls, exploration yachts display very decisive forms, square sterns like fishing boats and sometimes vertical bows like tugs. These features are reflected in the design of the superstructures - or rather in their "non design" - inasmuch as these vessels are rough and sharp and their forms are delegated more to the welder's skill than the designer's thought. Completely different from the little displacement yachts with rounded stern often seen in the Antibes area, characterised by soft, sleek and thrusting superstructures to suggest a speed which in any case, being displacement, they will never achieve, exploration yachts on the other hand seem to show all their power of ocean-going tugboats. In a certain sense these yachts are a success, with greater appeal to buyers precisely when their look is not so graceful: they are in fact convinced that they must inspire a sort of fear, be aggressive. They must, in a word, be capable of giving the owner an impression of their power on first glance. So the poorer the finish the better. Moreover, this solution is quite in vogue today because it permits, authorises the builder of such a boat to have it accepted and appreciated with a lower-profile and therefore less expensive finish. Which is actually acceptable in a vessel with a merchant look but would be wholly out of place with a conventional yacht. Built with "care", then, you can get considerable yachts on a really limited budget. 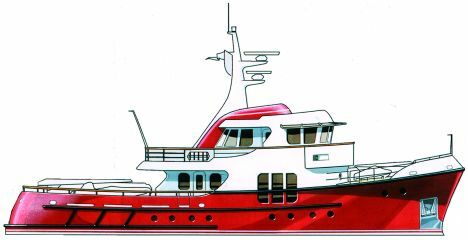 Fundamentally, when you design such a boat there are two possible avenues: the tug form with the deckhouse shifted forward and plenty of space aft, or the contrary. In the deckhouse forward solution the historical origin linked to tugboats is clear. Tugs in fact need the aft deck unencumbered in order to handle towing cables. A space which on exploration yachts, especially if they are large size, becomes the cockpit, access to the sea and housing for the tenders which are always very big and kept not in a garage but on deck. In the same way, with the deckhouse aft solution, a concept deriving from ocean-going fishing boats, the great tenders are stowed on the forward deck. This solution is definitely the right one if you really want to go to the antipodes or Easter Island because the accommodation aft is protected from running seas and infinitely less affected by pitching. Such a layout certainly wastes precious space and does not offer great liveable areas on the aft decks. This is why between the two I personally consider the tug look more suitable for private and non-commercial use. 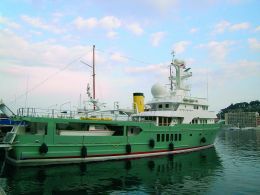 The younger brothers of the exploration yacht series deserve a separate mention: the legendary trawlers which have managed to find a niche on the market as classics and have prices and finishes equal to any other motoryacht of the same size. In my judgement, probably precisely with the smile of success these boats have abandoned their true essence since they are no longer built in metal or wood but in GRP, thus somewhat betraying their true vocation. In conclusion, the dream of those who have a real exploration yacht is to arrive in port late in the evening when there's a sea running outside and to slip in between two shiny motoryachts after dropping the fenders which, of course, will be lorry tyres.